Teachers stand outside to strike at Paz Elementary School, an Acero charter school in Little Village, on Dec. 4, 2018, at 6:30 a.m.
As mayoral candidates Toni Preckwinkle and Lori Lightfoot spar over their visions for a new era of equitable education in Chicago, they do so against the backdrop of unprecedented upheaval in the city’s charter schools. In the span of just three months, Chicago witnessed nearly 700 of its charter school teachers walk out on strike, with the Acero network launching the first charter school strike in U.S. history last December, and the Chicago International Charter School network teachers following suit in February. As of March 25, Chicago charter teachers at over a dozen other charter schools continue to bargain for new contract agreements with seven charter school operators, according to the Chicago Teachers Union. In addition to demands for more special education resources, higher wages and smaller class sizes, the contract agreements settled in both strikes with Acero and CICS include “true sanctuary school” policies, enshrining protections for undocumented students and aiming to give all students a safe and culturally appropriate environment to learn in. Along these lines, the union also called for more bilingual and Latinx teachers at Acero’s 15 schools, where an overwhelming majority of students are Latinx, but only 23 percent of the teachers are, according to information provided by Acero. “Sanctuary is always a part of our negotiations across the board,” said CTU Vice President Stacy Davis Gates, vice president of the Chicago Teachers Union, which joined forces with the Chicago Alliance of Charter Teachers and Staff, a union representing charter schools including Acero and CICS earlier this year. The merger was especially significant since the growth of charter schools in Chicago and elsewhere is widely seen as an effort to undercut the powerful Chicago Teachers Union, which represents about 25,000 Chicago Public Schools teachers and personnel. Their demands reflect a nationwide movement on school campuses to strengthen safe zones for undocumented students, galvanized after Romulo Avelica-Gonzalez, an immigrant father of four, was arrested by Immigration and Customs Enforcement while taking his daughter to school last year in Los Angeles. Acero charter school teachers also considered “true sanctuary school” policies essential when creating classrooms where students could feel safe, learn and thrive. But teachers envisioned a sanctuary school that provided more than just physical security for students. They also championed a contract that would increase bilingual education offerings, expand culturally competent curriculum and build a diverse teacher force. The sanctuary movement can be traced back to the 1980s when Central Americans fleeing violence caused by U.S.-backed civil wars sought safety in the U.S. and churches stepped in to provide “safe havens” for undocumented immigrants seeking asylum. Momentum for immigrant “sanctuary” has re-emerged and expanded to schools since the election of President Donald Trump. Calls for sanctuary protections in schools also increased with Education Secretary Betsy DeVos’ controversial testimony in front of the House Committee on Education and the Workforce hearing last year, when she declared that schools have the right to report undocumented students to ICE. Although DeVos retracted her statement following swift criticism from civil rights groups, her comments generated confusion among educators and families nationwide. 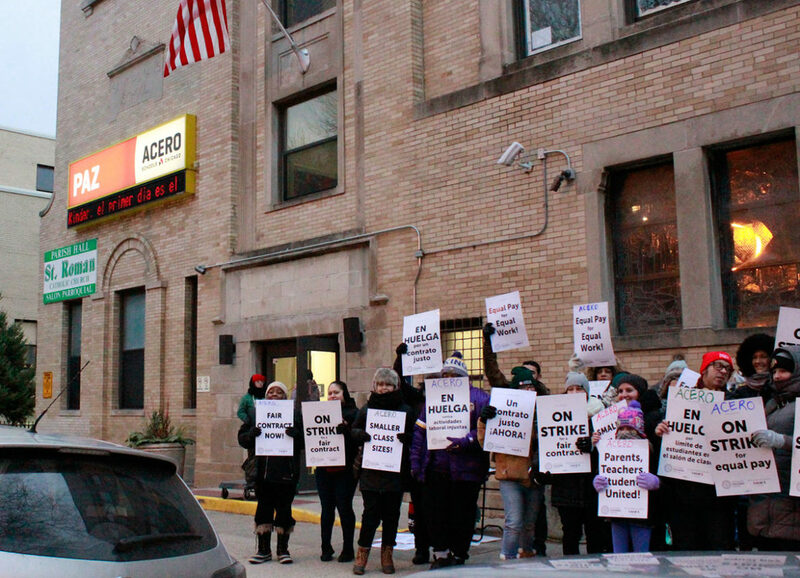 Monica Rojas, a third grade teacher at Officer Donald J. Marquez Elementary in the Brighton Park neighborhood of Chicago, joined the Acero strike on day one. As an immigrant, she expressed concern for the safety of her students, especially undocumented students. In 2017, Acero released a letter to parents and staff outlining their position as a “welcoming district,” and declared their intention to protect all students, regardless of immigration status. Acero said they would not collect information on the immigration status of students or families and that neither teachers nor the Acero administration could inquire about it. The administration would also deny ICE entry into the school beyond the entrance unless they presented “required legal documentation.” Acero’s CEO Richard Rodriguez, reiterated these commitments and made additional ones in another letter. “They had a policy in the network, but we were wanting to enshrine it,” said Andy Crooks, a CTU bargaining team member and special education apprentice at Cruz Acero school, saying he feared the Acero administration could overturn the school’s welcoming district policy at any time. CTU members on strike agreed with many of Acero’s positions, but the union wanted to hold schools further accountable to existing laws and stated promises. The Illinois State Board of Education law already prohibits schools from requiring parents or students to provide information that could reveal their immigration status. Immigration advocates also point to the rights of all children to access a K-12 education in the U.S., regardless of their immigration status, established by the Supreme Court’s Plyler v. Doe ruling in 1982. Other laws, including FERPA (Family Educational Rights and Privacy Act), mandate that schools must seek explicit consent from parents before sharing a student’s information, including a student’s citizenship status. ICE itself released a memo in 2011 outlining that they would not apprehend immigrants in “sensitive areas” like schools or churches. But reports of children or parents being apprehended by ICE while en route to school continue to instill fear and anxiety in undocumented families, Nancy Jodaitis, director of higher education initiatives at Immigrants Rising, said. Some organizations have offered recommendations on how schools can use the full extent of their legal authority to protect immigrant students and staff. Jodaitis identified the powerful role schools can play in upholding safe spaces that do not participate in what she referred to as the “school to deportation pipeline.” Jodaitis released a guide in 2017 outlining steps schools can take to enforce existing laws and constitutional rights protecting students who might be subject to immigration enforcement. Striking teachers said Acero charter school network needed to do more to provide their students with appropriate cultural and linguistic resources crucial to their success. Students at Marquez, who are over 99 percent Latinx, deserved not just personal safety under a sanctuary school police, but also sustained bilingual instruction and a culturally competent curriculum, Monica Rojas said. Chicago’s Acero charter school network was previously known by the name UNO, a Latino advocacy group started in 1984 to fight for the rights of Mexican and Chicano residents. UNO launched charter schools 20 years ago with aspirations to provide culturally relevant curriculum and innovative classrooms for Latinx immigrant students and families. But the organization’s labor practices garnered criticism and they were charged with fraud in 2017 for allegedly steering contracts to an executive’s relatives. Rojas knows firsthand the importance of “true sanctuary school” policies including robust bilingual education. She immigrated to the United States from Mexico at age 6 knowing just two words in English: “moon” and “turtle.” She started first grade in a bilingual classroom where her teachers spoke both English and Spanish. “Everything, I learned after that was from my bilingual teacher,” she said. Looking back nearly three decades later, she said receiving this extra linguistic and cultural support in her education left an indelible mark on her. In the school where she teaches, nearly 60 percent of students are English learners, according to data compiled by Chicago Public Schools. But Rojas said that Acero schools lack enough Spanish-speaking teachers. Classrooms, which currently allow 32 students, have become too large to give the necessary attention to students who are English learners, Rojas said. The new contract caps classes at 30 students. While this change is seen as an improvement, teachers noted that there was still a deficit of Spanish-speaking teachers. Rojas’ school tried to assign one bilingual teacher to every grade. But only a small portion of students end up receiving the bilingual services they need, she said. A 2014 Illinois law required schools to provide services in students’ native language. Prior to this policy, the charter school network (at the time known as the UNO Charter School Network), provided English-only instruction to their students. They even lobbied against the law before its implementation. Nearly half of Acero students have limited English, according to CPS data. And investigations revealed that the charter school network failed to comply with the law’s requirements in a timely manner. The new contract provides teachers with limited tuition reductions or reimbursements if they elect to take classes to become ESL- or bilingual-endorsed, said a field representative with Acero. 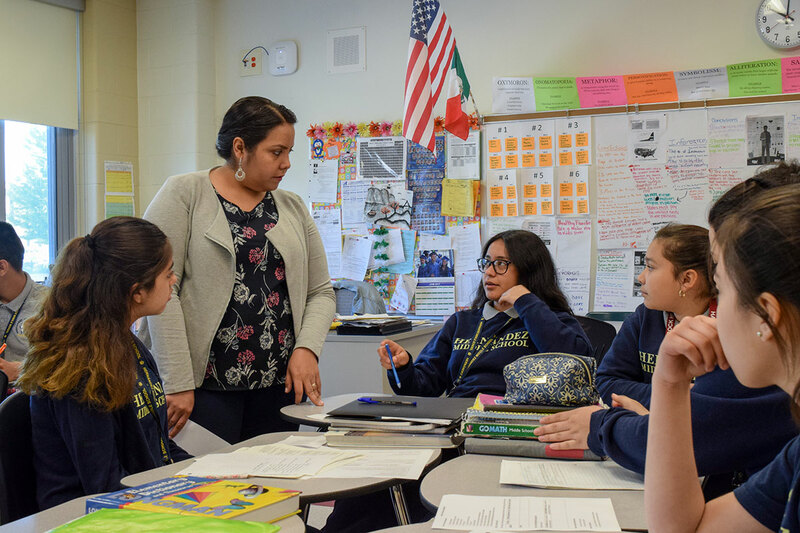 One way for the teachers to better reflect the largely Latinx student body and provide bilingual services is to promote the advancement of paraprofessionals, staff who assist teachers and who at Acero schools are often Latinx and bilingual. Paraprofessionals assist in classrooms, but receive less pay than teachers. They can also be expected to serve as translators for students who are English learners. The agreement reached between CTU and Acero takes steps to build a pathway for paraprofessionals to become teachers, and in turn increase the number of teachers of color. Janet Sotelo has worked at Paz Acero school for two years. Not only does she fulfill her responsibility of assisting students with diverse learning needs, but she also serves as one of a small group of translators for students whose first language is Spanish. “It’s very difficult, but it’s something that we have to do as educators,” she said. Originally from Mexico City, Sotelo, 33, immigrated to the U.S. when she was 4 years old. Within the first few hours of going to school, she knew she wanted to be a teacher when she grew up, she said. Sotelo would like to transition from her paraprofessional job to a teacher position. But she said the school had not provided resources or opportunities for her move up. The new contract will allow paraprofessionals like Sotelo to take leave—albeit unpaid—to get the certifications they need to become teachers, and Acero will guarantee them jobs when they return. The new contract also says Acero must provide a pay schedule for paraprofessionals with guaranteed raises based on how long they have worked at the school, according to CTU. Thought teachers strikes can be hard on parents, especially lower-income parents, Acero parents showed much support for the strike. Amarily Falcon has two sons who attend kindergarten and first grade at Zizumbo Acero school just north of her home in the West Lawn neighborhood. Camille Erickson is a Chicago-based journalist focused on labor and economic justice. Email her at erickson.cami@gmail.com and follow her on Twitter @camillesuzanne. One 25th Ward precinct is the only polling place in the city that provides dual language paper ballots in Spanish, Hindi, and Chinese.